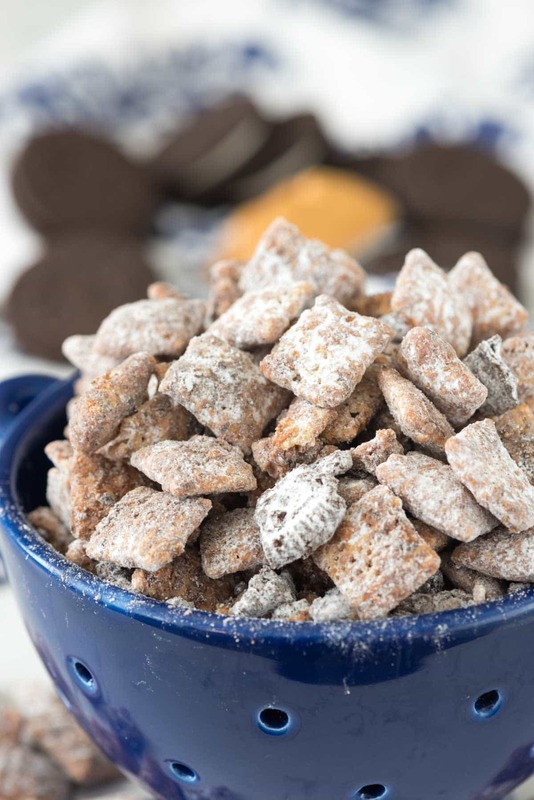 Peanut Butter Cookies ‘n Cream Muddy Buddies – add crushed Oreos to the classic puppy chow recipe for a fun flavor twist! I’m not gonna lie: just LOOKING at these photos makes me drool. 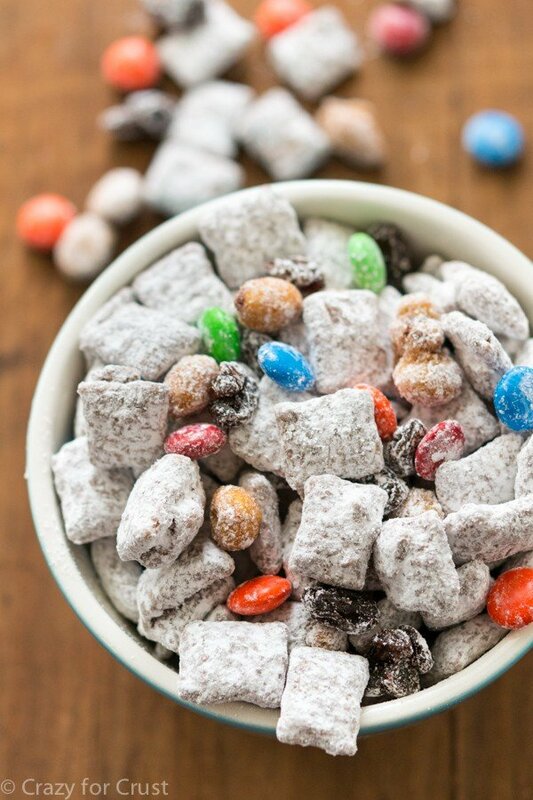 Muddy buddies are my undoing – I can eat an entire batch in one day if I’m not careful. ESPECIALLY if they have peanut butter AND Oreos in them. But first real quick: Have y’all seen Hidden Figures yet? You must. That movie was so good. I loved it, my husband loved it, Jordan loved it. We were all so moved by it too. There are lots of movies out there that depict segregation and atrocities like “colored” fountains and bathrooms, but for some reason this movie made it seem even more real. Maybe it’s because the women are fighting for their jobs and doing such good work for our country and at the same time having to run a half a mile to go to “their” bathroom each day. Until just recently, I had no idea that they used women as “computers” back during the time before computers, nor that there were some amazing African American women behind our space program. Jordan loves to watch that new NBC show, Timeless, and one of the episodes dealt with the man on the moon landing. The characters used the help of Dorothy Vaughan and I thought it must have been just for TV because if someone like that existed at NASA, I would have known about her. Then the movie preview came out…and I was shocked. She was real, as was Katherine Johnson and all the others who history forgot about. I was shocked…and outraged…and excited when Jordan begged to see the movie before it even came out. Anyway, I’m stepping off my soapbox now…but if you’re dealing with a rainy or boring Sunday…go see that movie! And make up a batch of this Peanut Butter Cookies ‘n Cream Muddy Buddies to sneak into the theater in your purse. I rarely change the original muddy buddy recipe because if it ain’t broke…right? I mean chocolate + peanut butter + Chex cereal…there’s nothing wrong with any of that. In fact, I’ve used this recipe but coated peanut butter pretzels and trail mix with the magical elixir that is the muddy buddy recipe. This recipe uses Chex cereal, as intended (you can use any kind of Chex you like) but instead of just coating them in powdered sugar I added some crushed Oreos in my shake, shake, shake. Brilliant, right? I mean, there are tons of Cookies ‘n Cream Muddy Buddy recipes out there…but they all use white chocolate and skip the peanut butter. WHY WOULD YOU SKIP THE PEANUT BUTTER? Just don’t, and add Oreos. Even my blogging friends know that peanut butter and Oreos belong together. Amanda has a peanut butter Oreos no bake cheesecake recipe. And Carrian has a recipe for mini peanut butter Oreo trifles. Swoon. Peanut butter cookies ‘n cream muddy buddies is the perfect snack recipe to make and binge eat while you binge watch TV…or do math. Enjoy these Peanut Butter Cookies ‘n Cream Muddy Buddies! 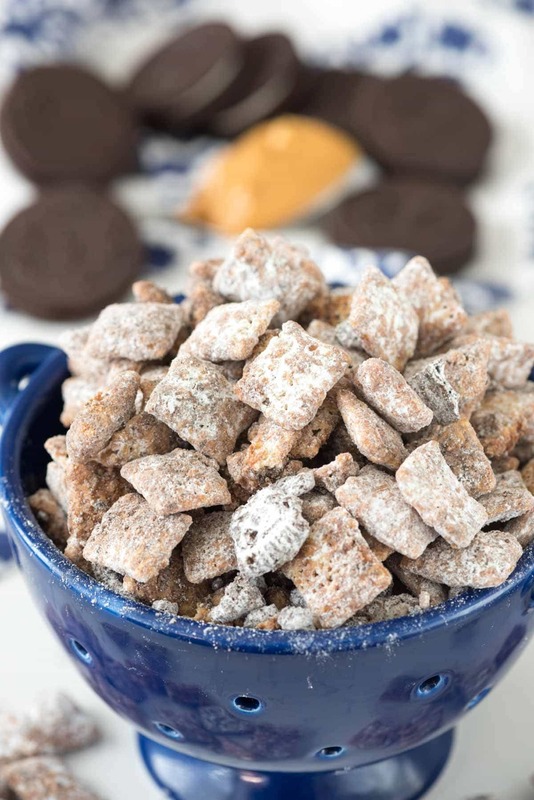 Peanut Butter Cookies n Cream Muddy Buddies - add crushed Oreos to the classic puppy chow recipe for a fun flavor twist! Place Chex cereal in a very large bowl. Place Oreos in a resealable ziploc bag and seal all but 1" of the bag. Roll with a rolling pin to crush. Place butter, peanut butter, and chocolate chips in a medium sized microwave safe bowl. Heat for 1 minute on high, then stir, heating again if needed to melt everything together. Add the vanilla and stir until combined. Pour chocolate over cereal and stir until completely coated. Place 1/2 cup powdered sugar and half the crushed Oreos in a gallon size bag. Add half the chocolate coated cereal to the bag and seal completely; shake to coat. Turn out onto a cookie sheet lined with parchment paper or wax paper. Repeat with remaining cereal. Let the mix sit until hardened on the cookie sheet then place in a large ziploc bag to store. Store for up to one week in an airtight container or bag. Oh, I’ve heard about that movie before! I really gotta watch it – women power indeed! Dorothy, I believe we are sisters from another mother, lol!!! The movie was Absolutely Fabulous, informative and inspirational. A great use of film and filming at its best. Thanks for children and their inquisitive minds. Oh and thanks for your Love of baking sweet treats too. BRAVO! 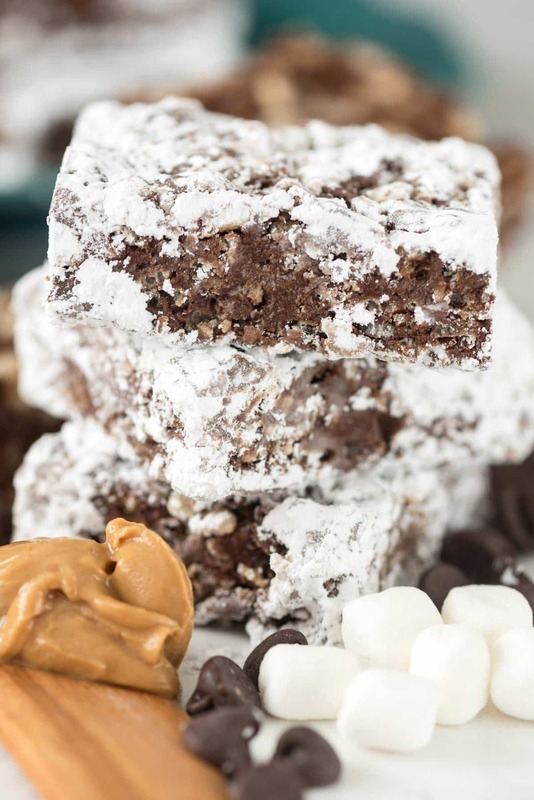 These look insanely good and I could eat a batch of muddy buddies in no time too! It’s the ultimate mindless munching perfect snack! I’ve heard about the movie but haven’t seen it yet. 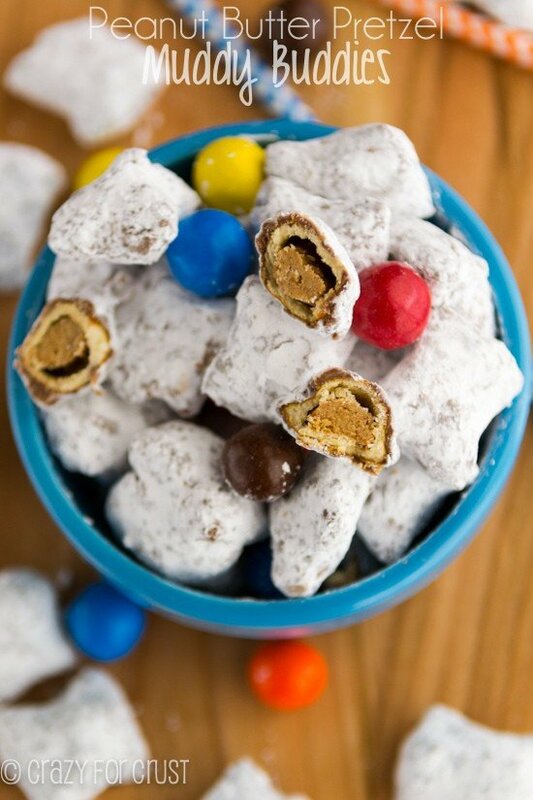 These muddy buddies look amazing and perfect for next week’s big football game! My kids will go crazy for these muddy buddies! Perfect to munch on while watching movies this weekend! These are genius! I’ve always steered clear of the cookies and cream muddy buddies because they leave out the peanut butter. Why would you do that?!? Thanks for solving that problem. 🙂 And speaking of problems…I thought I was the only one who loved geometric proofs! You mean I’m not alone after all? Yay! In college I took two semesters of Black History, and I never learned about these women, either. Talk about unsung heroes! Hey, these treats look delicious and portable. I’m thinking Super Bowl snacks. Just when I thought it was impossible to make Muddy Buddies (puppy chow, tomato tomahto) any more delicious, you go and throw this at us. Seriously, this stuff looks BEYOND addictive. I’ve gotta try it soon! I must be dreaming! This sounds heavenly!! PEANUT BUTTER. OREOS. MUDDY BUDDY HEAVENNNN!